This online banking Trojan modifies an affected system's proxy settings and adds a malicious root certificate to allow information theft at the network level. These behaviors are seen in malware used in Operation Emmental. It does not have any propagation routine. It does not have any backdoor routine. This Trojan does not have any propagation routine. This Trojan does not have any backdoor routine. This Trojan downloads Windows PoweSshell installer and installs it if the said Windows component is not existing. It imports rogue root certificates to browsers Internet Explorer and Firefox. 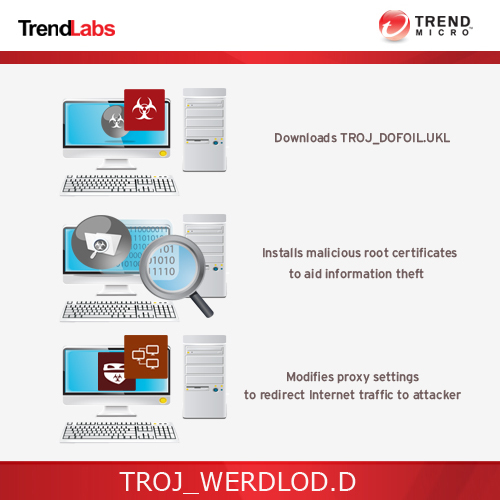 Scan your computer with your Trend Micro product to delete files detected as TROJ_WERDLOD.D. If the detected files have already been cleaned, deleted, or quarantined by your Trend Micro product, no further step is required. You may opt to simply delete the quarantined files. Please check this Knowledge Base page for more information.